Liam Jurrah trial, Day Two: Did he have a weapon in his hand? The court heard further evidence this afternoon regarding weapons allegedly in the hands of former star footballer Liam Jurrah (pictured), during events at Little Sisters town camp on the night of March 7 last year. Mr Jurrah is charged with causing serious harm to his cousin Basil Jurrah on this date and has pleaded “not guilty”. Philomena White, who describes Liam Jurrah as her uncle, said in her evidence in chief that he had a machete. He was with Christopher Walker who had a knife and Josiah Fry who had an axe. She said Liam Jurrah hit Basil Jurrah twice in the head with the machete and his companions also hit Basil. She said she saw them from the back room of House Number One; the light was off and there was no light outside; they were about six metres away. 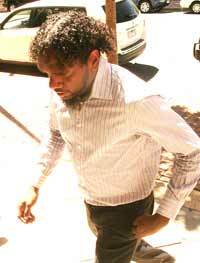 During cross-examination she said Basil Jurrah was carrying a nulla nulla and a rum bottle. She was reminded that during her evidence at committal (in July last year) she had said that Basil Jurrah was carrying a “machete, only that”. Was that true? Yes. Basil Jurrah was carrying a machete? Yes. Asked again a little later what Basil Jurrah had in his hands, she said “a nulla nulla and machete”. Further on she was asked if she saw Basil Jurrah fighting with a machete. No. With a nulla nulla? Yes. Who was he fighting? Liam Jurrah, Josiah Fry and Christopher Walker, she said. When he was fighting with a nulla nulla, did he have a machete? No. Did she see or was it too dark? She said she could see “clearly”. It was put to her again that she didn’t see: “I saw,” she said. Daphne White, Philomena’s aunty and cousin to Liam Jurrah, said she saw him at Little Sisters camp with “a little iron”, indicating that it was a bit less than a metre long. (She herself had an “iron picket” and was fighting with Elfreda Martin and was subsequently arrested on the night.) In cross-examination by Jon Tippett QC it was put to her that it was dark and she didn’t see Liam Jurrah with an iron bar, but she said she did. Ingrid White, sister to Daphne, mother to Philomena, cousin to Liam Jurrah, said he had a nulla nulla; Christopher Walker had an axe; Josiah Fry, an axe and Dennis Nelson a machete. She also said Liam Jurrah hit her on top of her head causing “a little cut”; Josiah Fry hit her on the forehead, causing a big cut. Ingrid White’s evidence will continue tomorrow. This morning the court heard from Freda Jurrah, mother to Daphne and Ingrid, aunty to Liam, that he “something” in his hand, indicating a length of 60 cm. Her grandson Lemiah Woods said Liam Jurrah had a crowbar in his hands and at another stage, an axe with which he smashed a car. The court also heard evidence about drinking on the night. Lemiah Woods said he had been drinking “down the creek” but not at Little Sisters. However, Philomena White in cross-examination said he was drinking at the camp with Samuel White, Ingrid White and Daphne White. What was he drinking? VB. Daphne was drinking rum and she was sharing it. Daphne White began drinking in the creek about 2pm and continued drinking at Little Sisters, she said, but it was “just me … by myself”. She was drinking rum, she said, and was not sharing. Was she drunk? Yes, “a little bit”. Later, Mr Tippet put to her that she was “really drunk”, but she said she had drunk “only half a bottle”. Mr Tippet suggested that she didn’t see much, she was “very, very drunk and it was dark”, but she insisted she was only “a little bit” drunk: “When I’m full drunk I go to sleep,” she said.